Mithloraite wrote: I've found a card based on a Diamond Tech DT-0196H chip that seems to support high dma. When one compares the drivers from a MJ-013R00 card with an ALS100 driver package, there are many similarities. They are definitely based on the same code, it is mostly the names that have been changed.... Diamond put a rebranded Avance Logic chip on their card. On dosforum.de they made the same observation, of it being an ALS007. PARUS wrote: It's fortunate, I found parameters for SPDIF IN! To turn on playing from digital in I type CMMIX /DIG:M and to turn on recording I type CMMIX /DIG. That is a great find! I am sorry I could not be of help. PARUS wrote: I remember that picture you gave me here. Do you think that is great decision to make TTL signal? That is on page 4, there is a text document attached together with the image. Have you read it? It mentions the Coax to TTL circuit output goes up to 5 Volt. If it still does not work, maybe you can add an adjustable resistor somewhere to tune the voltage. gerwin wrote: When one compares the drivers from a MJ-013R00 card with an ALS100 driver package, there are many similarities. They are definitely based on the same code, it is mostly the names that have been changed.... Diamond put a rebranded Avance Logic chip on their card. Dear Gerwin, thanks, that was something quite expected. Diamond never did a thing of their own as I remember... mostly they used the chips made by S3, even ARK Logic for their video cards and they surely could 'borrow' some for their sound cards. What is of main interest is a bigger PCB than most of the other SB-16 clones might have, a real (or at least a separate) FM music chip and possibly better sound quality. You have mentioned C-Media has no oscillator - here it wasn't removed from the final product. What is certain there are different quality lines of this very model as some don't even have the name Yamaha stamped on the FM chip. As the evidence goes, Diamond never left the courts due to their deliberately "poor" accounting and marketing schemes to leave their customers with questionable product. Though we all know the main questionable product in history is Creative MPUs on 4.05+ DSP. A well made ALS card with all sound channels nicely made, with a real oscillator and FM might be of interest as contrast to buggy MPUs of the 'real' Creative. Pity I'll have to wait for a couple of weeks before I listen to this card. At least it has a separate Line Out so bypassing a crude internal amp should not be a problem. I wonder if we might send the signal from it to AWE64 LINE IN to add some chorus and reverb - and still have a more accurate FM music, contrary to AWE64 CQM. It comes as no surprise, you are right. It's an Avance Sound Device when installing under Windows 98. But it well may be of interest. In Wolfenstein-3d it has beautiful stereo digital effects like Creative SB-16 and AWE models. As we know even under DOSBox only SB16 setting gets stereo digital effects operating in Wolfenstein. That stereo works with this card. 100% clean positioning. What is even better the digital effects never disappear from the game on a faster system (Pentium 1). I have been plagued with this Wonfenstein effects sound loss since the 90s: all Creative cards, PnP and non-PnP alike were at times losing the sound of doors opening, screams and such. This clone has no such problem. It's just great. The stereo digital effects are always here, not a moment of sound loss. As regards the sound quality I checked the amplified Speaker Out yet, it's no more noisy than Aztech's and similar cards. It doesn't catch any noise from HDD reads (like some Aztech cards unfortunately do it). EDIT: the Line Out output is clean. No hiss, medium power. Can be amplified to make a good sound source. The card has a chip that is marked 'Yamaha OPL' and it sounds pretty good. Might need a recording to do but I think I know Wolfenstein music to be sure Also this clone is a full-width card and has a spacer hole so it can solidly carry a Roland or any big wavetable. The renamed 'Diamond' drivers for this card are not silly. They create "Diamond Sound Logical Device" tabs with numbers from 0 to 3 which are a "Wave Audio Device", "Internal Midi (OPL3) Device", "Joystick Device" and "External Midi (MPU-401) Device". They take the best well-known and compatible addresses, IRQ and DMA by default. Install it and run Wolfenstein, it will find everything without tweaking. What are the best games to test SB-16 specific capabilities? I'll throw them at this clone and see. Many thanks to gerwin! I read his review about AV310 and decided to try this card for getting SB16 voice sounds by SPDIF and try to connect another digital source by SPDIF IN. I have shown this connection earlier only like interesting idea. Today it is reality. I found that AV310 can detect incoming signal not only at 44,1 kHz but at 48 kHz too. It converts 48-44 quickly and without delays, sound pitch doesn't change. Incoming signal get mixing with its own voice/fm signal and sounds excellent! The voltage amplitude of SPDIF IN signal must be not higher than 3,5-4V, otherwise sound may get not correct and very noisy. Out is 44,1 kHz always. I joined SPDIF IN on AV310 and SPDIF OUT on Terratec EWS64 XL. On EWS64 total mixer sound routes to ADC of Dream processor and present on its SPDIF OUT. The sound quality is more better than usually on analog outs of ISA boards. We can hear Crystal SBpro compatible codec and fm, midi daughterboard, CD in, Line in. All mixed signals come through AV310, by the way we get SB16-sound, and then to AV-receiver SPDIF. Later I will tell more. Thank you. Sorry for my English if I speak not strictly correct. Interesting setup Parus, and thanks for sharing the details on how to make S/PDIF in work. Would you be able to show us a photo? I am also using the CMI8330 again, in my 486 system. Mithloraite wrote: As regards the sound quality I checked the amplified Speaker Out yet, it's no more noisy than Aztech's and similar cards. It doesn't catch any noise from HDD reads (like some Aztech cards unfortunately do it). EDIT: the Line Out output is clean. No hiss, medium power. Can be amplified to make a good sound source. Sounds like a different beast then the ALS100 I briefly tested. Maybe the Diamond card and/or chip is truly a superior specimen. Or maybe DAC quality in these cheaper asian audio chipsets just varied wildly from card to card. The opinions on the CMI8330 DAC quality also seem to vary. Yes of course I can do it. I'll show connections scheme picture and setting up resources. But it has a little relevance to current topic about SB16 clones. It is a multiformat sound system and has separate "SB-Pro" and "SB-16" boards. Thus we get simple decision of sbpro compatibility issues on sb16 cards by using them separately. Total purpose is to reach most SPDIF sources of traditional sound formats in pure DOS and to convert to SPDIF analog sources which haven't digital out (for example Roland MT-32). The TeleVideo Multimedia: Telesound Pro16. Never heard of it but it has what appears to be IDE headers for certain brands of CD-Drives (and a Sony floppy header?). I assume it's a Soundblaster 16 clone anyway. The Sony one isn't a floppy connector, but another proprietary CD-ROM interface of the early 90s. It just used a 34-pin connector instead of the standard 40-pin. tokyoracer wrote: The TeleVideo Multimedia: Telesound Pro16. Never heard of it but it has what appears to be IDE headers for certain brands of CD-Drives (and a Sony floppy header?). I assume it's a Soundblaster 16 clone anyway. Driver package for this card shows files named "Snd929p.vxd" etc. which is associated with the Opti 82C929 MAD16 Pro chipset. You should find this chipset under the sticker. 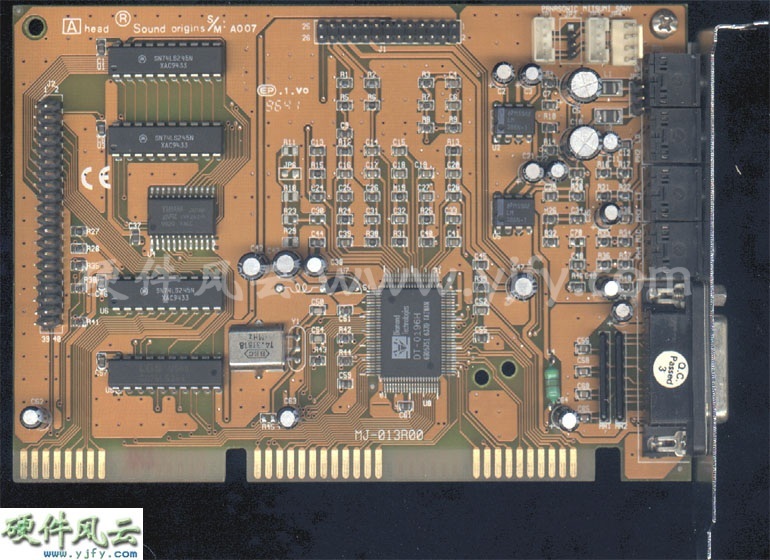 This chipset does 16-bit audio and is SBPro/WSS/MPU-401 compatible. Interesting info, thanks for shedding some light on this. I had no idea it had MPU-401 compatability which is pretty cool. I bought an Asound 3D PnP with the ALS120 chip off ebay. Tried it in DOS, 98, and XP and it sounds really terrible. The hiss and noise is louder than the actual sounds it's trying to play. I can't imagine this is normal and the way it was when new. Plugged it into an amplified speaker and with the volume up all the way I can just barely make out the music. Used the mixer in dos and windows to turn it up but it's about as good as a paper cup connected to a string. Do the OpAmps fail or could it be something else? I thought about bypassing the opamp and running the output from the ALS120 threw a lm386 amplifier. Any suggestions on this board or should I throw it out and try again? TandySensation wrote: I bought an Asound 3D PnP with the ALS120 chip off ebay. Tried it in DOS, 98, and XP and it sounds really terrible. The hiss and noise is louder than the actual sounds it's trying to play. I can't imagine this is normal and the way it was when new. Plugged it into an amplified speaker and with the volume up all the way I can just barely make out the music. Used the mixer in dos and windows to turn it up but it's about as good as a paper cup connected to a string. I bought an ALS100 Plus and it's pretty much the same. Not as bad as you described, but there's a loud hiss which can be heard regardless of the amplification level. If it weren't for that, it would be a pretty darn good SB16 clone. As it is now, it's useless to me. Totempole wrote: I bought an ALS100 Plus and it's pretty much the same. Not as bad as you described, but there's a loud hiss which can be heard regardless of the amplification level. If it weren't for that, it would be a pretty darn good SB16 clone. As it is now, it's useless to me. I had a Reveal version of that card. same layout in every way with the exception of my chip was labled Crystal. I figured out the problem with the ALS100 that sounded terrible. The speakers/headphones. It sounded really awful with headphones plugged in and a set of speakers I had. Tried some other speakers and it sounded reasonably good for a low end generic ISA sound card. I don't know why it would sound terrible on some speak but it does but I'm glad I kept it. Is this a SB16 clone? "Amigo Audio Blaster"
I can make out an OPTi logo on the controller chip, on the left of the yellow stickered Codec chip. OPTi advertises as SB Pro compatible, not SB16 compatible. to get the card running (which at the moment for some reasons i don't know does not; Win95c) and to take a first glance, i have no idea, whether it is a good choice or not. Is anyone out there with some experiences or further information? Is it worth going any further? I found another board that looks a lot like Mithloraite's. It is a Diamond MJ-013R00 as well but the FM chip isn't marked as Yamaha and the opamps seem to be different (which I don't mind, since I only use Line-Out anyway). I'm not sure if I should buy it or not... I need another ISA board, as I now have a Pentium without a sound card, and being able to hold my DB50XG is a nice bonus. Did Mithloraite ever reach a verdict if the Yamaha on his board is genuine of a remarked one? Guess worst case scenario I could always try sourcing an OPL3 chip and soldering it in place of the clone.